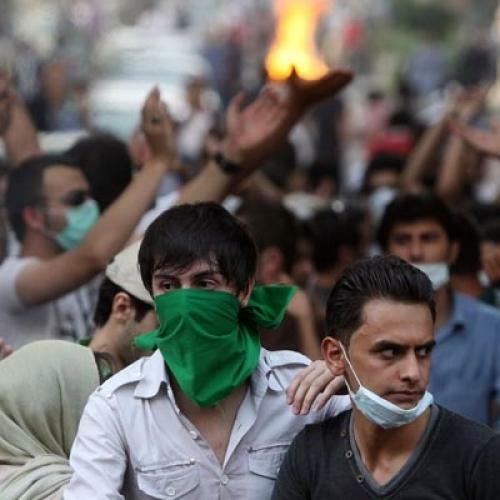 With the second anniversary of Iran’s Green Movement earlier this week, it’s worth keeping track of the cruel litany of bloodshed and oppression that the regime continues to carry out against its own people. Just in the last few days, when democracy advocates in Tehran tried to commemorate the remarkable street protests that followed the fraudulent elections of 2009, the regime once again responded with a massive show of force. Beginning the night before, regime thugs and police took over the streets where the demonstrations were planned to be held. A couple hundred demonstrators have been reported to be arrested. And in the last two weeks, two heroes in the fight for dignity and democracy in Iran died at the hands of the regime. The first was Haleh Sahabi, a woman of vast erudition, who diligently explored the texts of the koran and its exegesis for arguments making Islam compatible with democracy and women’s rights. She died, after being beaten up by regime thugs, for insisting on proper burial rights for her father—a heroic death in the manner of the Greeks’ Antigone. Her father was one of the most esteemed members of Khomeini’s first cabinet, put in place in 1979, when the wily ayatollah was still putting on the pretense of democracy. The second casualty was an artist, democratic activist, and humanist by the name of Hoda Saber. Those who knew him describe him as a self-effacing but assertive, humble yet resolute, defender of human and artistic dignity. He was arrested a few months ago on no apparent charge. As he languished in jail, he heard of the brutal death of Haleh Sahabi two weeks before and went on a hunger strike. He had no demands for himself; he simply wanted to protest an injustice. After a few days, Saber’s situation worsened, and his cellmates asked the authorities to take him to a doctor. When he returned from the hospital infirmary, Saber protested that, rather than attending to his heart condition, the regime’s goons took the opportunity to assault him. This is attested to by the signed statement of sixty-four of his cellmates, each a member of Iran’s democratic movement. Not long after the onset of his health problems, Saber died of heart complications. Finally, for almost a year and a half, the nominal leaders of the Green Movement—the allegedly defeated candidate, Mir Hossein Mousavi, and his wife, Zahra Rahnavar, along with Mehdi Karubi and his wife Fateme—have been harassed on the street and subjected to harangues in the state-run media and calls for their death in the parliament. And yet, at first, they were not arrested—the political cost of such an act was deemed too high at that time. But 124 days ago, after an initial attempt at obfuscation and denial, the regime admitted to putting the four leaders under arrest. And last week, when ex-president Khatami demanded the freedom of the four, a conservative politician close to Ayatollah Khamenei declared that the four leaders “have not changed their position on any of their claims,” and therefore could not be freed. On top of it all, the Iranian regime is not only brutally suppressing the democratic aspirations of its own people, but it is now actively helping the Syrian government in its murderous campaign against its citizenry as well. When will the international community—from China and Russia, who keep offering the regime diplomatic cover, to Turkey, India, and many Western companies, who continue to make money in Iran and find clever ways to bypass U.N. sanctions—say enough is enough? When will they assert vigorously that governments like Iran, Syria, and Libya, governments that so egregiously trample upon the democratic rights of their people, have no place in the international community? To be sure, there are signs of internal fissures within the regime. Khamenei and his cronies are accusing Ahmadinejad and his allies (now called “the deviationist line”) of all manner of perfidy—using government funds to buy nine million votes in the last presidential election, using devil conjurers and voodoo artists to “foresee the future,” putting curses on their opponents, and generally planning a gradual seizure of power. But the outcome of this internal power struggle is largely irrelevant—neither man represents a good outcome for the Iranian people, nor is their feud likely to topple the regime on its own. The Iranian regime combines the logic of a schoolyard bully with the self-profiting ethos of a bazaar merchant. It will stop bullying its people only when the cost of that brutality becomes intolerable.